In what will hopefully be a recurring series on older Development Tools, Languages, and Platforms, I will be covering some information on my old flame, Visual Basic. 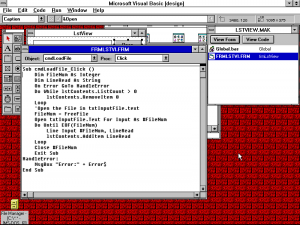 Visual Basic has a relatively long history, going back to around 1991. BASIC itself, of course, has an even longer history, starting at Dartmouth College in the 70’s. The question is- What made Visual Basic Special? One of the big things going for it at the time were that it was the easiest way to develop applications for the booming Windows Desktop. It made many development tasks easy, provided form designers where you would otherwise need to write layout code, and in general made the entire process of Windows Application Development a lot more accessible. 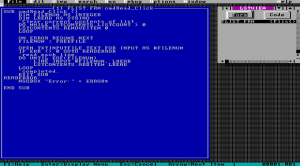 Visual Basic was one of the earliest examples of a “RAD” Tool. RAD- or “Rapid Application Development” essentially allowed a company or other entity to get a feel for how a idealized Application might look and feel with minimal effort. By making UI design something that requires very little to no code, the task requires less expertise- that is, the Company doesn’t need to use their Development Team Resources for that part of the design process. Another huge boon of the technology was that it made Application Development on Windows far more accessible- at least to those with big wallets, but considering the cost of a computer and software in those days finding a person with a computer that wasn’t in a financially secure situation was not very likely. A full synopsis of the history of Visual Basic and it’s origins isn’t really appropriate here, and has been covered far better by those actually involved in the process. You can read one such overview Here. In this series, I will first cover Visual Basic Versions from 1.0 through 6.0; and possibly go through the various .NET implementations as well. As I flow through one version to the next, we will see the Language and it’s surrounding Toolset (IDE) evolve. Visual Basic 1.0 for Windows was released in 1991. It was part of a move by many companies to get Powerful development Tools on the increasingly popular Windows Desktop Environment. Visual Basic itself grew out of it’s spiritual predecessor, QuickBASIC. It made some cosmetic changes to the language, and changed it to be Event Driven. 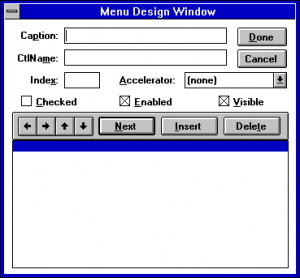 Visual Basic also introduced two modes of operation, Design-Time and Run-Time. At Design Time you would edit your code and your forms. During Run-time, you could stop the application (using either the Stop statement or a breakpoint). As we see above, Visual Basic 1.0, Running on Windows 3.11, showing the Form View. I’m not sure why I went with BRICKS.BMP, usually I’m more a MARBLE.BMP guy but hey no accounting for taste. One thing that may surprise those used to later versions of Visual Basic might be that you can still see the Desktop. 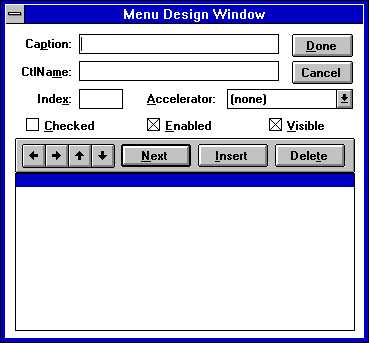 the MDI interface wouldn’t be around until Visual Basic 5, at which point it was optional for VB5 as well as VB6. (you can invoke both with the /sdi command line argument to switch to SDI and /mdi to switch to MDI, in addition to configuration options). The “Project Explorer” if we can call it that- is shown on the right. Right now it’s showing Global.bas- a Module inserted into every application, and also the only module in VB1 allowed to have Globals, which may be responsible for the name, and FRMLSTVI.FRM, which is the form file I created; that form is shown to the left, and to it’s left is the Toolbox, from which you can choose a variety of Visual Basic Controls. One of the interesting features of Visual Basic was it’s support for Custom Controls. Custom controls were specially coded DLL files with the .VBX Extension, which stands for “Visual Basic eXtension” because I guess using X’s in extensions was the cool thing to do back then- we didn’t know any better. These had to be written in C or another language capable of using the appropriate Visual Basic Control Development Kit, or CDK. There were a lot of Custom Controls Available for VB 1.0 that added a lot to VB Applications. Along the Main Window (shown at the top) we notice two things: first, it lacks the Toolbar we would normally come to expect, and the Properties Editor is rather spartan, and takes up that area of the window. 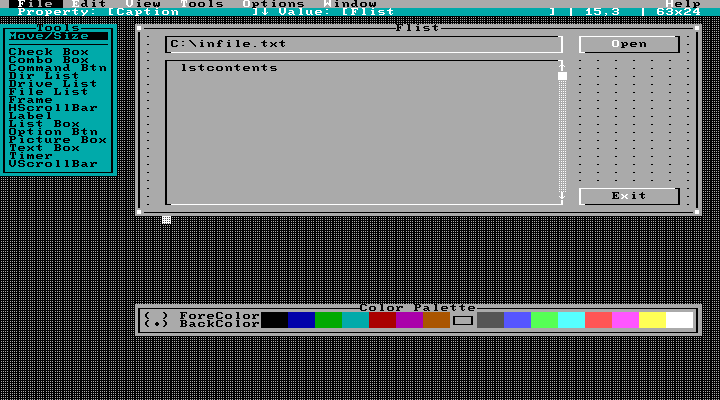 A hand-built, Custom File Open Dialog. And, a fairly terrible one, at that. Of course the one included with Windows 3.1 wasn’t exactly the pinnacle of UI ease of use either. We will see this dialog evolve over time as well with new versions. Here we see the code Editor. I’ll be frank: it’s terrible, even for the standards of the time. It’s little more than a glorified Notepad, really. It also forces you to edit your source files one procedure at a time. unpleasant, really. It does auto-correct your casing, which I suppose is something. Breakpoints are shown in bold. The Form Designer doesn’t let you select multiple controls by dragging a box around them, but you can use Control+Click to do that. To be fair this isn’t much different than the same Program would probably look in VB6; with a few exceptions that we will obviously touch on as we move up through the versions. Visual Basic 1.0 was a runaway success. For some reason this popularity apparently impacted the DOS toolset teams, since the successor to QuickBASIC PDS 7.1 was a new version of QuickBASIC that did not have the same name- Visual BASIC 1.0 for DOS. 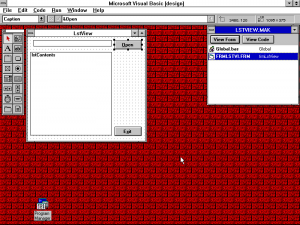 Visual BASIC 1.0 for DOS in Form Design View. 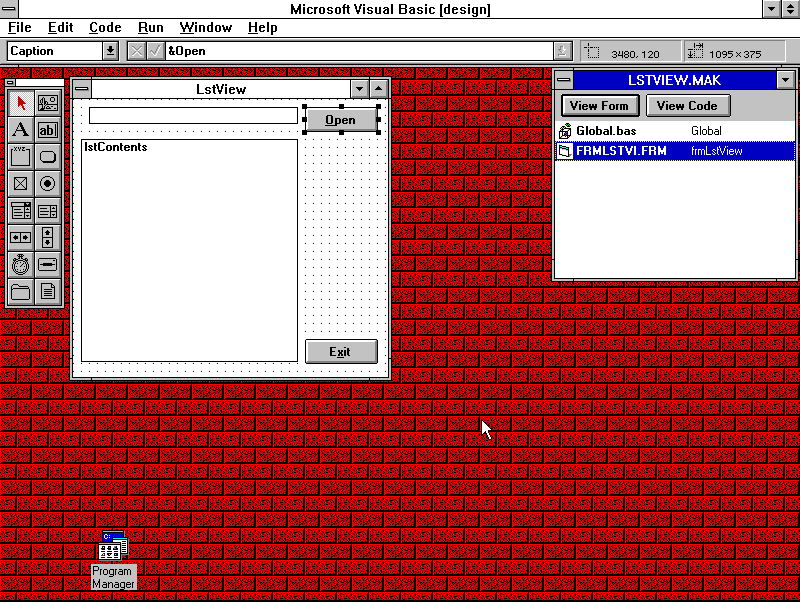 What makes Visual BASIC 1.0 for MS-DOS interesting is that’s it’s only kinda sorta a Version of Visual Basic. For one, all the literature uses BASIC in capitals for whatever reason, and working with it feels very much the same as working with QuickBASIC 7.1 PDS, but with a special Character-Set GUI thing. In many ways it was more of a stopgap version for transitioning QuickBASIC users to Visual Basic for Windows. In the next entry in this series, we’ll take a look at Visual Basic 2.0; what does it improve over 1.0 and How does it move RAD forward? Stay tuned and find out! » Filed Under: Microsoft,Programming,Visual Basic.